I’ve been visiting Finland and working with Fiori since 2007. I’m fortunate to have the opportunity to work closely with these singers and I find them very inspiring. I’ve written and arranged more than 12 pieces for them so far, including settings of early Greek lyrics from 6th & 7th centuries BC. I originally studied classics at Oxford University in the 60s before deciding to concentrate on music, and for many years I regarded myself as a ‘lapsed classicist’, until I thought I should try to revive my earlier interest in ancient Greek literature before it’s too late! When I asked Fiori if they would be happy to sing in ancient Greek, they said “fine, as long as you tell us what it means and how to pronounce it!” So I set some lyrics of Sappho for them in 2007. They performed these in a concert in London in 2010, and since then everyone who heard them has been asking, when are they coming again? So this is their long-awaited return visit. 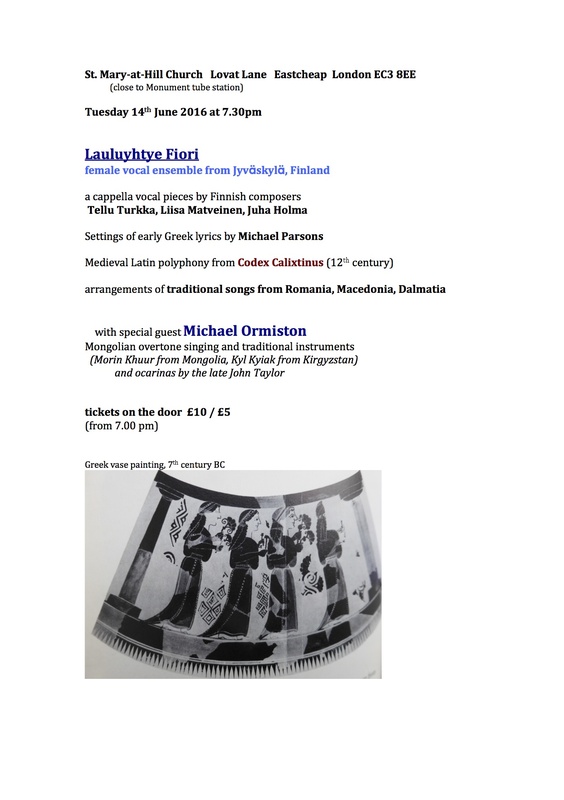 As well as Greek lyrics, I’ve arranged traditional songs from Macedonia, Dalmatia and Romania, and their programme also includes pieces by Finnish composers. As special guest we’ve asked Michael Ormiston, an amazing performer who has studied overtone singing and instruments in Mongolia, and is the leading exponent of this style in UK. This concert should be a very special and memorable occasion! Here’s the information. Michael Parsons’ concerts are always wonderful — and they’re especially wonderful when he either is working out new ideas or is exploring the music of other nations. And in this concert, he does both. Here’s the information. Interesting, indeed! Parsons is unique ( ‘lapsed classicist’? well, I think that even his most experimental and ‘free’ compositions have a touch of classicism). I hope the concert will be recorded. Previous Previous post: Happy birthday, Erik Satie!